Yesterday we went out at around lunchtime for a quick run to Hawes and back. I had intended to watch the online streamed coverage of the Northwest 200. But although the weather here was superb, they were one of the few places in the UK to have rain. I watched one race and the other had been put back a bit so we decided to go out on the bikes instead, as Helen was keen on trying out her new gel seat and we needed to test the new Autocom leads as well. We left home and headed straight for Settle on our usual tried and tested route. To our horror we discovered that they have started to resurface the road from Wigglesworth to Settle. When I say resurface what I actually mean is throw done gravel and tar and expect the passing traffic to finish it off. This is not a major route so I expect that we will have to take it easy on this stretch for a good few months. We then headed for lunch at our usual tearooms in Horton-in-Ribblesdale. When we pulled up we got talking to a guy on an Aprilla who had broken down and been waiting for 2 hours already. His breakdown cover was with MCE as part of his policy. After lunch we headed to Hawes and then headed back home the same way we had come. The good news is that the new Autocom leads have fixed all of our problems and the audio and bike to bike comms is better than it has been in ages. If your Autocom is giving you issue it might be worth checking this lead out first. The other good news is that the gel seat worked wonders for Helen. She also noticed the seat was slightly raised at the front which also meant that she didn’t feel like she was being lent forward towards the tank. So all in all the seat is an expensive cure to the issues she was having. 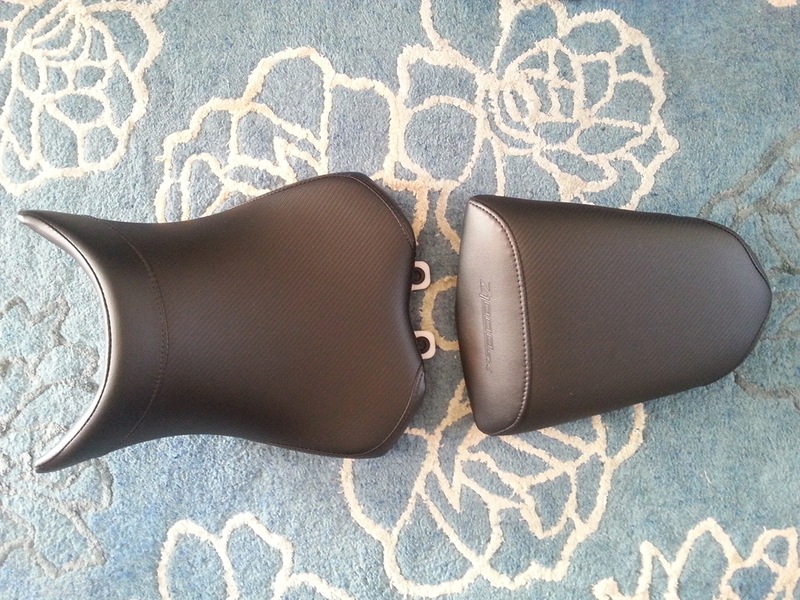 Helen has has just bought a genuine Kawasaki gel seat for her Z1000SX. She decided to buy one after our ride last weekend as going over all the bumps really hurt her backside. Hopefully the gel seat will cure this and she will not get any further problems like this. The big test will come when we go on our 2 week tour of the Pyrenees. 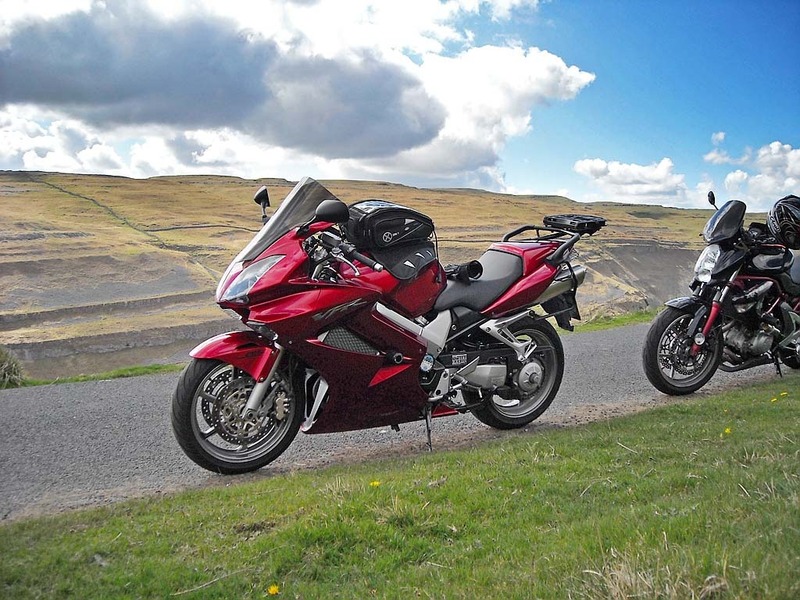 We went out on bank holiday Monday for a run around the Dales and test out all the equipment we had recently fitted on the bikes. Due to the weather being hot we decided to avoid the main roads and instead have a ride around on very minor roads, what we like to call goat tracks. We went on one of our tried and tested routes, that has served us well on previous busy bank holiday weekends. We left home and headed for Settle on our usual route via Clitheroe, Sawley and Wigglesworth. We then headed North on the B6479 towards Langcliffe. We turned right here onto minor roads and headed for Malharm Tarn. At Malham Tarn we bared left and headed towards Arncliffe. We then passed over the small bridge by Darnbrook House and then rode alongside the Great Clowder. We then passed through Arncliffe and headed towards Kettlewell after joining the B6160. We had intended to stop in Kettlewell at the Cottage Tea Room, but Kettlewell was very busy as they had an event going on. So we decided not to stop and continue on to Reeth. We left Kettlewell and headed towards Braidley we negotiated Park Rash and passed alongside Hunters Stone Bank. We then passed through Horsehouse and Gammersgill before arriving in Carlton. We then continued through Melmerby and Agglethorpe before joining the A684 at Wensley. 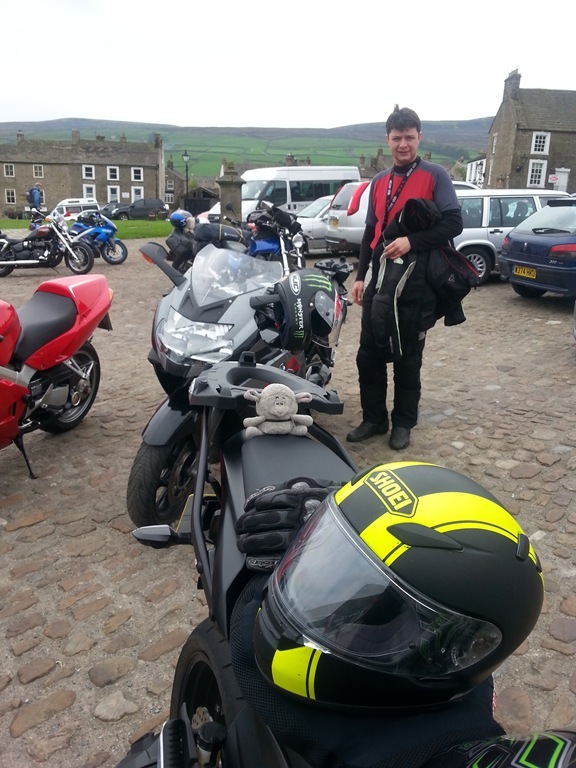 We continued down the A684 into Leyburn where we took a left and headed over Preston Moor towards Reeth. We then went over Ellerton Moor before dropping down into Grinton. This part of the road was very busy and it even had temporary traffic lights set up at two of the tight passing spots on this road. We realised when we go to Grinton why this was, the main road out of Reeth was closed and all the traffic was being diverted this way. I would guess this has something to do with the Tour De France, as it is coming this way is July. In Grinton we joined the B6270 and headed into Reeth, because we didn’t stop in Kettlewell we had lunch in Reeth instead of the usual ice cream. 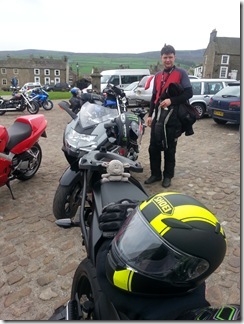 We left Reeth and continued down the B6270 heading for Muker. We passed through Healaugh, Feetham and Gunnerside on the way to Muker. Just after Muker we turned left and headed over Buttertubs Pass to Hawes. Our route from Leyburn to Hawes is the exact route the Tour De France will follow on Stage 1 of the race from Leeds to Harrogate on the 5th July. We passed through Hawes and took the B6255 towards Ribblehead Viaduct as usual. We turned left at the Viaduct and headed for Settle. We stopped in Settle for an Ice Cream from the Ye Olde Naked Man Cafe. 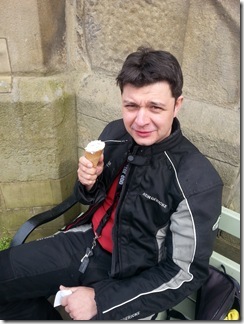 After our ice creams we left Settle and then continued on home via Sawley, Saben and the A56/M66. The new Satnav audio feed worked as expected on the Autocom unit. Both bike to bike radios worked but it is obvious we need to replace the leads between the units and our helmets as they have damaged wires in them. 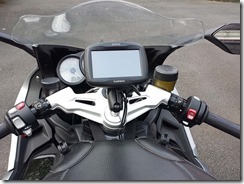 Today I installed Helen’s old Autocom unit on the her new Z1000SX. There is only one place you can really install it, if you still want access to the unit for adjustment and that is in the space behind the battery under the rider’s seat. The only downside to this location is there are no holes are anything else to secure the unit to. This meant that it had to be stuck down onto the flat plastic directly. At first I tried some glue on the old Velcro faster but that didn’t work. In the end I stuck it down (doubled over underneath unit) with some black Duck Tape and then for added security also put some over the top as well. 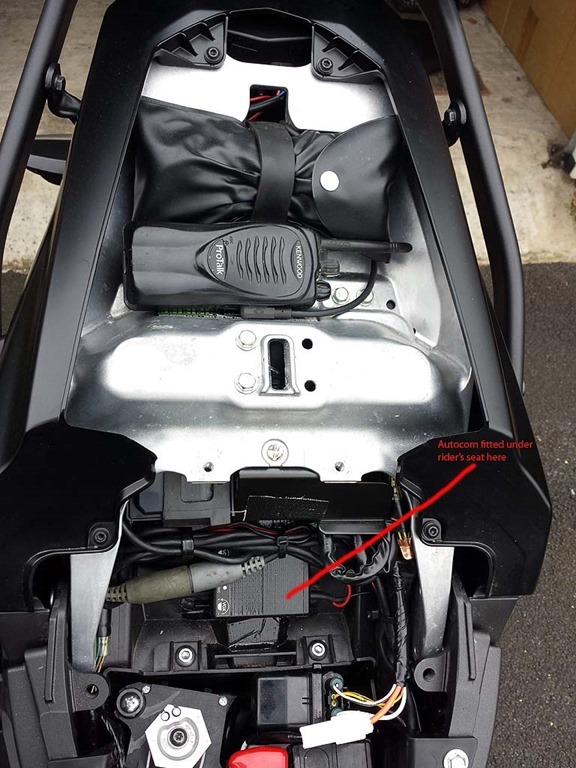 I had previously checked that the radio would fit under the pillion seat so the cable to it had already been routed through to that location. So all I needed to do was connect up the positive, negative and route the main rider headset wire. I spliced into the rear taillight circuit and solder the positive wire to it at the rear of the bike. 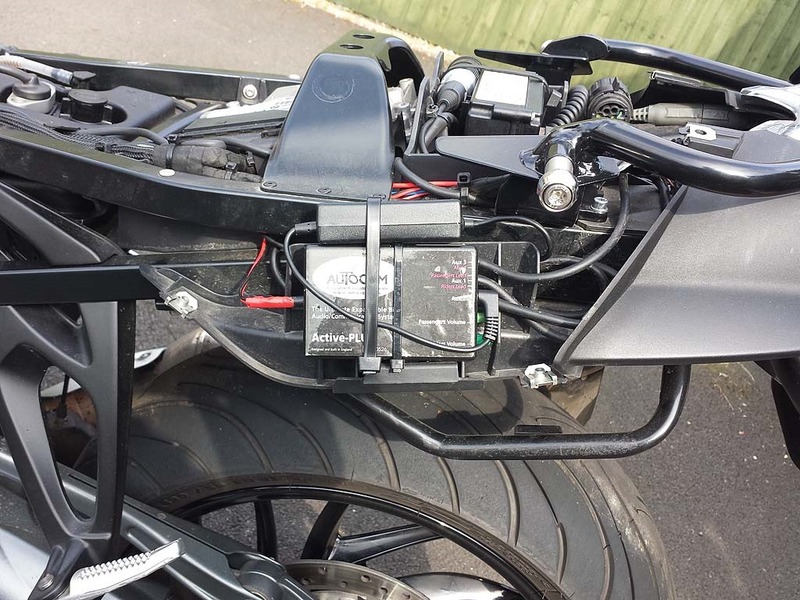 You will find a 3 pin connector at the rear of the bike with Red, Black/Yellow, Blue coloured cables at it. The Red wire is the positive supply for the light, obviously it is switched on with the ignition. I connected the Negative wire directly to the battery, you always need to do this on Autocom systems otherwise you will get engine noise interference. I then routed the rider’s headset lead alongside the battery to the petrol tank and left it sticking out under the left front side of the rider’s seat. Then I put everything back together and it worked as it should. I have noticed that both of the leads that connect in between our helmets and this connector are a bit dodgy. Wiggling them causes them to crackle or not work all together. The wires internally have obviously been damaged by the constant bending and twisting of the cable. So I have ordered two new cables at £15.00 each. 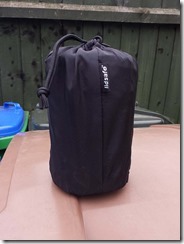 We have recently purchased a pair of Pacsafe Lidsafe bags to put our helmet’s in when we are away from the bikes. We will only likely use them when we are touring and the topboxes are full. We felt we needed to buy these as we love our Pacsafe Stuffsafe and neither of our bikes have helmet hooks fitted to them. There is nothing worse than having to lug all your bike gear with you when you go and visit a castle in the hot sun. 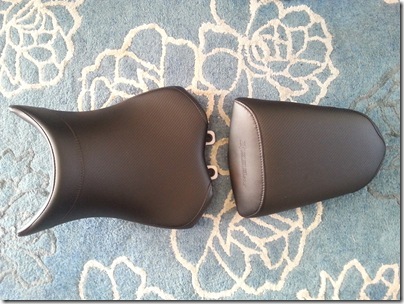 Helen’s Z1000SX doesn’t have any hooks under the seat and my K1300S hooks were part of the rear grab handles. These handles were removed when I fitted the topbox rack. Last year we were able to use the hooks under the seat on Helen’s old VFR. 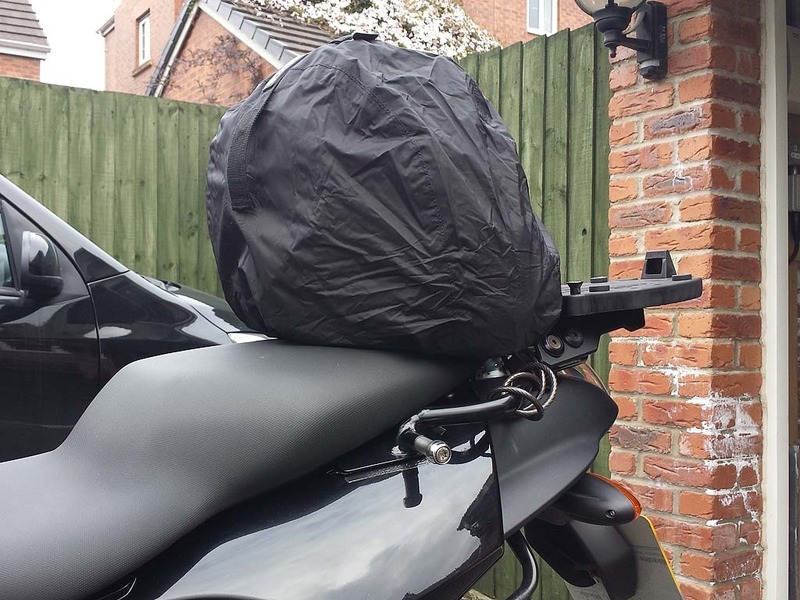 But obviously the helmets will be far safer in these bags with the eXomesh® protection and on the plus side they will also now be in a waterproof bag. They pack down to around the size of a pint glass and don’t really weigh anything ever. 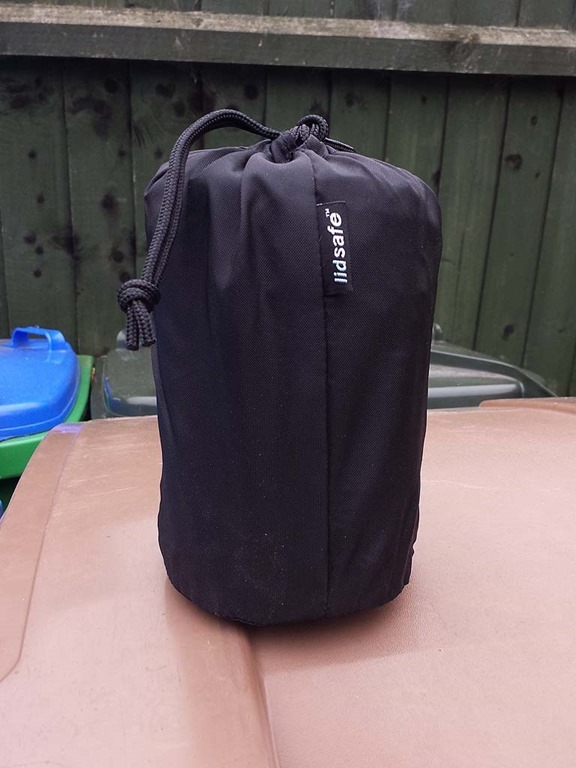 They will easily fit in our topboxes and also help stop gear in the topboxes moving around. It would appear that both of these products are now discontinued so if you want either I would buy them now while you still can. Although it was nice and sunny today I decided to do some work on my bike rather than go out for a ride. So I installed the audio lead from the Garmin audio out jack to my Autocom. Before I installed it I checked to make sure that it worked first and that no bike noise was induced into my headphones. All worked well so I went about stripping the bike down and removing the petrol tank again as well. 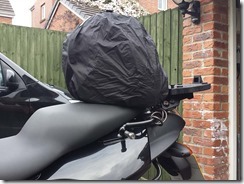 The install went ok and the new lead was plenty long enough to route around the bike. I managed to install the lead’s isolation box on top of the Autocom unit, it just fitted in. I then put the bike back together and all seems to work perfectly and the volume is just right. The minor downside is that the install at the Garmin end isn’t as neat as it was before, but at least I have sound now. 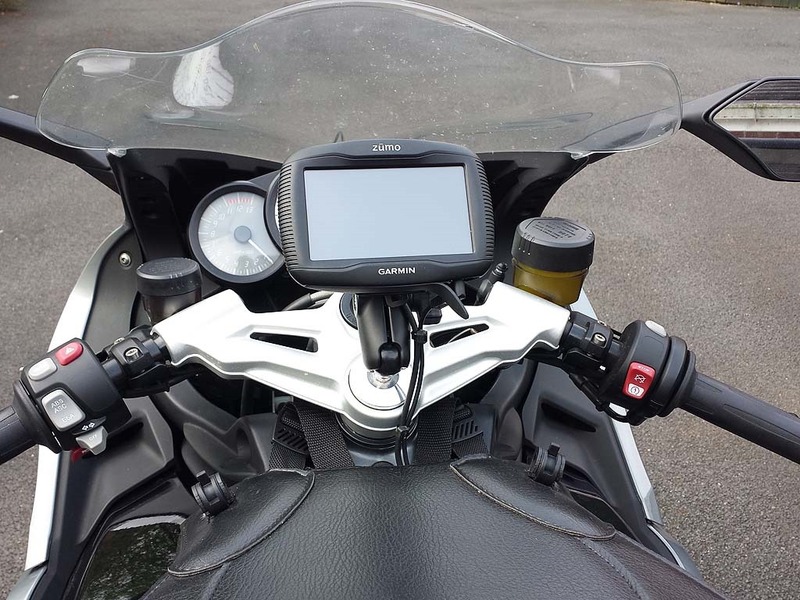 I also installed the slightly larger Ram mount bracket that I used to use with my TomTom satnav. This has lifted the Garmin slightly higher up and in my opinion is a much better location as I don’t have to look down as much. The dials are all still perfectly visible as well over the top of the Garmin, so it is a win win situation all round.